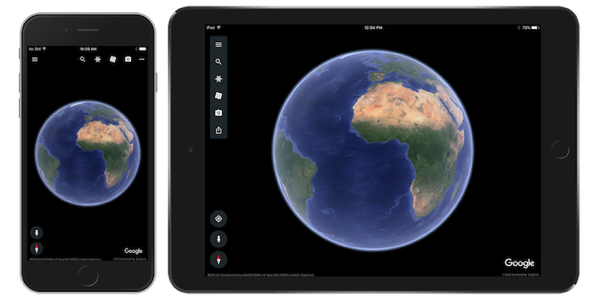 The all-new Google Earth App for iOS also includes the interactive stories feature Google calls “Voyager”, which helps you find your next travel destination with the helps of stories. Of the now over 140 stories available, 17 cities can be found in the “travel” category, offering itineraries for top cities around the world. Maybe you’re a lover of the outdoors? Visit the brown bears of Alaska’s Katmai National ParkAll-New Google Earth App for iOS Hits the App Store, ride the curl with Super Surf Spots, or trek Machu Picchu. Culture buff? Discover a new exhibit with Museums Around the World or follow in the footsteps of the Fab Four with Beatlemania. With more than 140 stories in eight languages, Voyager has travel ideas for just about everybody”. The updated app also introduces the new “Knowledge Cards”, which are fact-filled cards that tell you more about places and landmarks you’re viewing. You can even use the app to send postcards to friends, by snapping a picture from a place you’re viewing in Google Earth.